Volunteering can help you learn new skills, meet new people and feel good about helping others. Researchers have found it can benefit your health, too. Healthier blood pressure: A Carnegie Mellon study revealed that adults 50 and older who volunteered about 200 hours a year were less likely to develop high blood pressure than non-volunteers. Healing post-traumatic stress disorder (PTSD): This is a hard-to-treat condition suffered by nearly 8 million American adults, many of them military veterans exposed to combat. A Saint Louis University study concluded volunteering regularly through community agencies effectively helped more than 300 veterans cope with PTSD. Protect your brain: Several studies, including Arizona State University research involving more than 13,000 people, found volunteering frequently over a period of years decreased the risk of memory and other thinking problems in later life. Control weight and blood cholesterol: Teenagers who volunteered to help younger children weekly had lower cholesterol levels and healthier weights compared to a control group who didn’t volunteer. 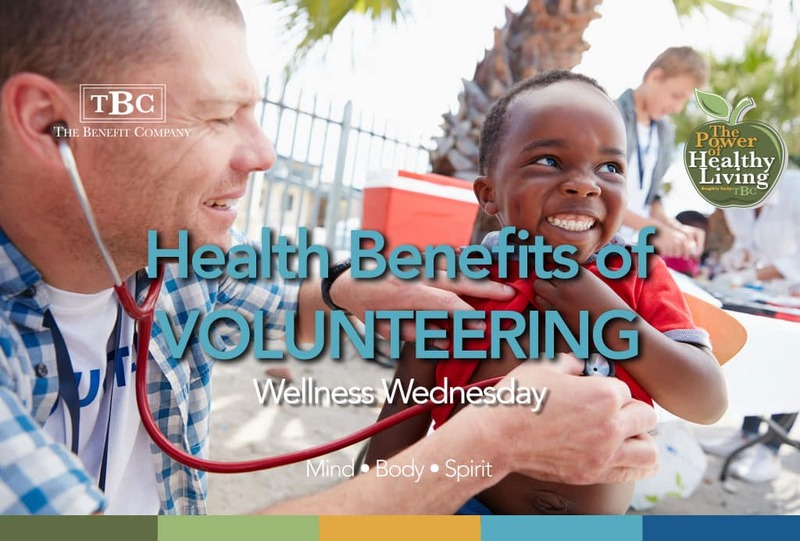 Live longer: Results of the Wisconsin Longitudinal Study found that people who volunteered regularly and frequently to help other people extended their lifespans beyond non-volunteering peers. Consider all of these benefits when weighing the idea of giving employees time to pursue volunteer opportunities. Happy, healthy employees always translates into a stronger work culture and more engaged associates. Do you want more Health and Wellness news to share with your organization? Join our complimentary Power of Healthy Living email newsletter with articles like this and many more useful tips monthly.